At times, a game of football can look like the most beautiful and elegant sporting event taking place between top gifted athletes in the eye of the spectator. 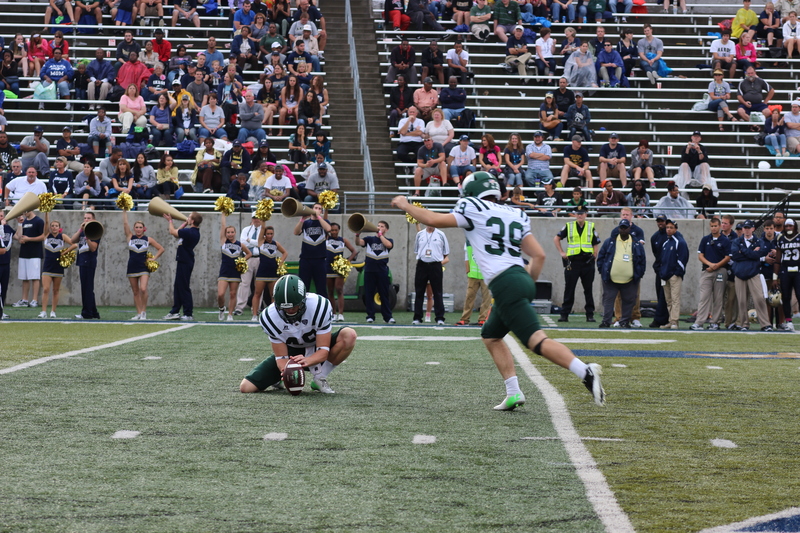 On Saturday at InfoCision Stadium, the contest that took place between the Ohio Bobcats (4-1, 1-0) and the Akron Zips (1-5, 0-2) was the exact opposite due to unfortunate weather conditions. The sloppy hodgepodge of blue and green bodies bounding after the football resulted in defensive dominance, peculiar scoring methods and a 43-3 Bobcat victory to open up MAC action for Ohio. It was only fitting for the Green and White to open up conference play in typical Mid-American fashion. What best captured the madness that ensued in Akron on a cloudy and wet Saturday afternoon were the events that occurred after Ohio’s first possession. Punting away after five plays, Grant Venham’s boot landed in the arms of Akron’s Imani Davis, only to not be there seconds later after Miles Chapman jarred the ball loose. The mad dash for the ball resulted in an Akron recovery in the end zone and two points for Ohio to start the game. Once the Zips were able to begin their first offensive drive, it didn’t take long for Akron to get things started. Familiar foe Akron running back Jawon Chisholm, who battered the Bobcat defense for over 200 yards of total offense last year, broke off a 23-yard run into Ohio territory. Akron’s drive sputtered, however, and the Zips had to settle for a 31-yard Mark Stein field goal to take the lead, 3-2. “We were calling the right plays against the right defenses,” Foster said. The 13-yard circus catch with just over three minutes left in the first quarter gave the lead back to Ohio, but Tettleton continued to force passes into tight spaces and double coverage. 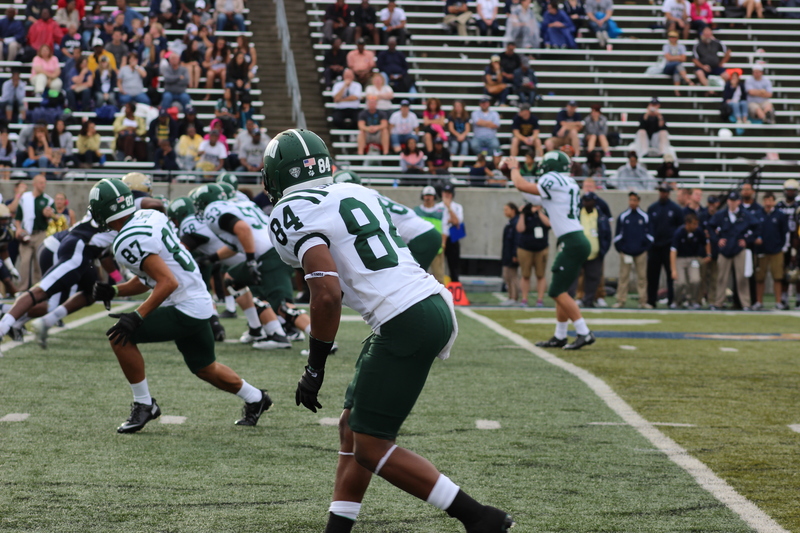 The ensuing drive saw the same over-aggressive Tettleton that was present during the team’s first four drives return, throwing an interception to Akron cornerback Malachi Freeman near the end of the first quarter. When the second quarter got underway, an amped Bobcats team took the field for the remainder of the game, blowing out the Zips over the final three quarters of play. Teamwork was key for Ohio’s first possession of the second frame. The running game finally came alive after a 19-yard scamper by Beau Blankenship that was only possible thanks to a ferocious guiding block by Tettleton. One thing led to another, and immediately following the first-down run, Tettleton aired it out to Foster. The wide receiver made some nice moves for a 43-yard gain, leading to a one-yard touchdown pass to tight end Troy Mangen off of a beautiful play-action fake to Blankenship. The score capped off Ohio’s longest offensive drive of the game, a nine-play, 87-yard drive that revitalized the offense after a week of rest. The defense continued to follow suit, and two plays following the Bobcat score, safety and Akron native Thad Ingol was able to intercept a deep Pohl pass near midfield in order to help his offense put more points on the board. The 34-yard return – plus an additional 13 yards due to an illegal block called on Akron – put Ohio in the red zone, shortly leading to a one-yard rushing touchdown by running back Ryan Boykin. found themselves producing points for their teammates. Ingol found himself in the middle of the action after a hit on Pohl in the backfield jarred the ball loose. Ingol scooped up the ball at the 18-yard line, spun his way around multiple tacklers and fell into the end zone for six points. The Zips offense was preventing the team from getting anywhere close to the 30-3 advantage that the ‘Cats held at halftime. Eight sacks, 12 penalties for 135 yards and only 157 yards of total offense highlighted a composed and smart performance by the Ohio defensive unit and a rushed and overwhelmed showing by the Akron offense. This allowed Ohio to rest their starters before the end of the third quarter even came around. A pair of Josiah Yazdani field goals (35 and 28 yards respectively) and a one-yard rush by running back Daz’mond Patterson finished off the scoring parade by the ‘Cats. “We haven’t had many conference games where we’ve been able to get everybody in like we did in this game and then feel comfortable after you get into the second half,” Solich said. “You don’t have many of those kinds of games in the MAC. Ohio will travel back home to Peden Stadium for a Homecoming matchup against the Central Michigan Chippewas. Kickoff is at 2 p.m. on Saturday.